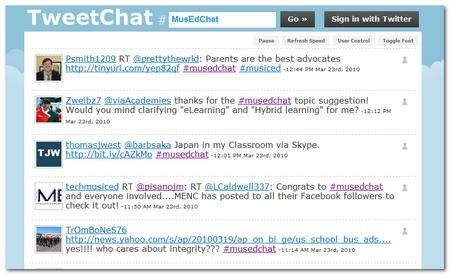 #MusEdChat -Music Education Chats Using Twitter -Find Out About It! If you are an educator and consider yourself Web 2.0 Savvy, then no-doubt you’ve seen the Newest Music-Related Twitter Phenomena -#MusEdChat. If you haven’t heard about it, then prepare to get enlightened -Web 2.0 Style! I can remember just about a year ago when Andy Zweibel (http://andyzweibel.com/) was talking with me about his “brainstorm idea” of starting a Music Educator Chat on Twitter… He had recently been watching some of the Ed Chats (#EdChat) that some of the k-12 Educators had started on Twitter and thought that replicating it for Music Educators would be a great way to bring Music Educators together to start discussions. As it turns out, it is -AND -he was right! About a four weeks ago, we held our first #MusEdChat -it was a smashing success. Many Music Educators from the U.S. and other Countries showed up for the maiden voyage. Since then it is slowly making it way into the consciousness of the Twitter-sphere. Right now, the biggest barrier to getting more people involved with the #MusEdChat Twitter Chat is the self-imposed barrier that some folks have about using Twitter in the first place. -More on that topic later at MusTech.Net in a future post! If you know of more “Press” or articles about #MusEdNews, please let me know as I will be keeping some type of ad-hoc assembly of these related documents. You can find the Tweet Archives here direclty if you are unable to access MusicEdMajor.Net. Finally, PLEASE help us spread the Word! Here’s hoping to see you all next week at the #musedchat!